What is it that the world doesn’t ‘get’ with Syria that leads to the continuing reluctance to unequivocally condemn and speak out against Bashar Al Assad’s regime among so many otherwise intelligent people? The Assad regime is using warplanes, helicopter warships, tanks, Scud missiles, cluster bombs, phosphorous bombs, TNT-filled barrel bombs, rocket launchers and assorted other weapons against civilians. Over 70,000 Syrian people have been officially documented killed to date, more than 5,000 of those are children. The real death toll may be twice that and it is rising by the day. Hundreds of thousands are imprisoned, ”missing,” maimed, crippled, over four million in the country need urgent humanitarian aid, over 2.6 million are displaced, over 700,000 are refugees…the horror statistics go on and on…and the world collectively shrugs, sighs and turns away. I realise that people have the right to say this isn’t happening. They also have the right to say that the sun doesn’t rise in the east, although repeating the latter patent falsehood at least doesn’t make them tacitly complicit in genocide, as repeating the former one does. Of course, people have the right to believe what the Assad regime and its supporters tells them – that it is a heroic and embattled state fighting heinous and possibly fanged radical Islamists and jihadists intent on its destruction, who are part of a foreign plot by the CIA to overthrow The Only True Anti-Imperialist State In The Region. 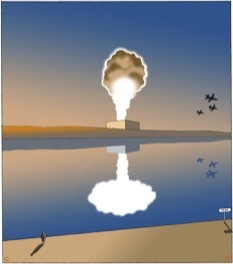 People also have the right to believe what Israel and its supporters tell them – that it is a heroic and embattled state fighting heinous and possibly fanged radical Islamists and jihadists intent on its destruction, who are part of a foreign plot by Iran to overthrow The Only True Democracy In The Region. Both arguments, for the Assad regime and for the zionist state, have exactly the same amount of legitimacy and merit and stand up equally well to even the briefest scrutiny or analysis, which is to say none and not at all. People have the right to say that they wish to remain neutral on Syria. 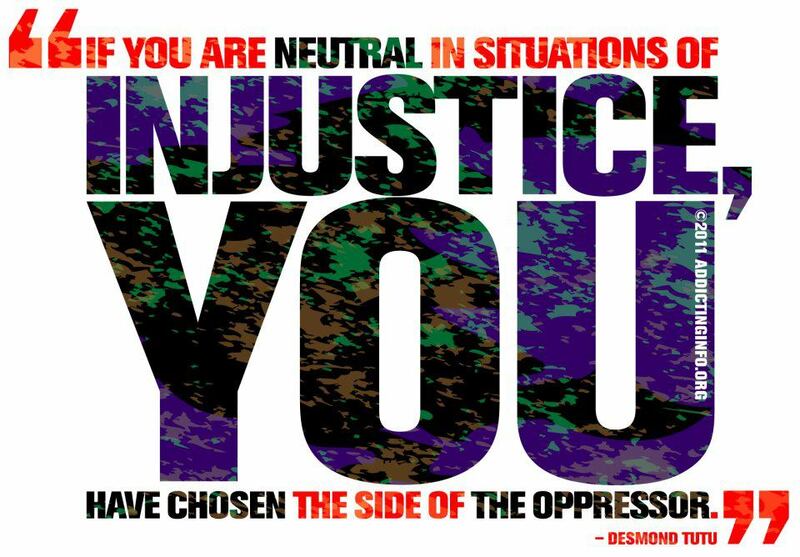 In the end, however, as Desmond Tutu wisely noted, ‘If you are neutral in situations of injustice, you have chosen the side of the oppressor.’ ”Neutrality” – or simply indifference – from the outside world is what all abusive spouses, all dictators, all totalitarian regimes, all brutal and oppressive states rely on in order to continue with their brutality and oppression. Neutrality in such monstrously unjust situations is not an admirable and objective stance, but a tacit nod and wink to evil. People have the right to suggest that maybe dictators are better for some – if they themselves are prepared to give up their own freedoms and live under dictatorship since of course they wouldn’t be hypocritical enough to wish for others what they don’t wish for themselves (perish the thought…). People also have the right to say that Western democracy is a sham, and I would agree wholeheartedly that it could certainly be massively improved. But oddly I don’t notice the Western totalitarianism groupies actually rushing to renounce their citizenship of horrid sham democracies in favour of emigration to glorious people’s republics, or indeed campaigning for fewer rights in order to feel less oppressed by the horrors of democracy. People have the right to say that Western leaders and governments are monstrously hypocritical, amoral and indifferent to human life, paying only lip service to the ideals of freedom and human rights while actually opposing them whenever expedient for their interests. And I would agree wholeheartedly without reservations. I’d also suggest that this is one more reason why we should not exhibit the same monstrous hypocrisy, amorality and indifference to human life – because if we pick and choose which people’s freedom and human rights to support or oppose we are no different, no less hypocritical, amoral and indifferent to human life, and certainly no better than those governments we condemn.